Godzilla in 1954's Godzilla. The techniques developed by Eiji Tsuburaya for Toho Studios continue in use in the tokusatsu film and television industry. Tokusatsu(Japanese:特撮, "special filming") is a Japanese term for live-action film or television drama that makes heavy use of special effects. Tokusatsu entertainment often deals with science fiction, fantasy or horror, but films and television shows in other genres can sometimes count as tokusatsu as well. The most popular types of tokusatsu include kaiju monster films like the Godzilla and Gamera film series; superhero TV serials such as the Kamen Rider and Metal Hero series; and mecha dramas like Giant Robo . Some tokusatsu television programs combine several of these subgenres, for example the Ultraman and Super Sentai series. Tokusatsu has origins in early Japanese theater, specifically in kabuki (with its action- and fight-scenes) and in bunraku, which utilized some of the earliest forms of special effects, specifically puppetry. Modern tokusatsu, however, did not begin to take shape until the early 1950s,[ citation needed ] with the conceptual and creative birth of Godzilla, one of the most famous monsters (kaiju) of all time. Bunraku (文楽), also known as Ningyō jōruri (人形浄瑠璃), is a form of traditional Japanese puppet theatre, founded in Osaka in the beginning of 17th century. Three kinds of performers take part in a bunraku performance: the Ningyōtsukai or Ningyōzukai (puppeteers), the Tayū (chanters), and shamisen musicians. Occasionally other instruments such as taiko drums will be used. Eiji Tsuburaya was a Japanese special effects director responsible for many Japanese science-fiction films and television series, being one of the co-creators of the Godzilla series, as well as the main creator of the Ultraman series. Ishirō Honda, sometimes miscredited in foreign releases as "Inoshiro Honda", was a Japanese film director and screenwriter. He is best known for his kaiju and tokusatsu films, including several entries in the Godzilla series, but also worked extensively in the documentary and war genres earlier in his career. Honda was also a lifelong friend and collaborator of Akira Kurosawa, and worked with Kurosawa extensively during the 1980s and 1990s. Godzilla is a 1954 Japanese kaiju film featuring Godzilla, produced and distributed by Toho. It is the first film in the Godzilla franchise and Shōwa series. The film is directed by Ishirō Honda, with special effects by Eiji Tsuburaya. The film stars Akira Takarada, Momoko Kōchi, Akihiko Hirata, Takashi Shimura, with Haruo Nakajima and Katsumi Tezuka as the performers for Godzilla. In 1954, Godzilla kickstarted the kaiju genre in Japan called the "Monster Boom", which remained extremely popular for several decades, with characters such as the aforementioned Godzilla, Gamera and King Ghidorah leading the market. However, in 1957 Shintoho produced the first film serial featuring the superhero character Super Giant, signaling a shift in popularity that favored masked heroes over giant monsters called the "Henshin Boom" started by Kamen Rider. Along with the anime Astro Boy , the Super Giant serials had a profound effect on the world of tokusatsu. The following year, Moonlight Mask premiered, the first of numerous televised superhero dramas that would make up one of the most popular tokusatsu subgenres. Created by Kōhan Kawauchi, he followed-up its success with the tokusatsu superhero shows Seven Color Mask (1959) and Messenger of Allah (1960), both starring a young Sonny Chiba. 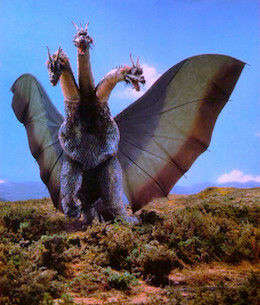 King Ghidorah is a film monster originating from Toho's Ghidorah, the Three-Headed Monster (1964). Although Toho officially trademarks the character as King Ghidorah, the character was originally referred to as Ghidrah in some English markets. Shintoho Co. Ltd. was a Japanese movie studio. It was one of the big six film studios during the Golden Age of Japanese cinema. It was founded by defectors from the original Toho company following a bitter strike in 1947. Super Giant is a fictional Japanese superhero featured in a successful series of serial-like tokusatsu short feature films produced between 1957 and 1959 by Shintoho. He is also known in Japan as Giant of Steel, is known in America as Starman, and known in France and Italy as Spaceman. These original productions preceded the first color-television tokusatsu series, Ambassador Magma and Ultraman , which heralded the Kyodai Hero genre, wherein a regular-sized protagonist grows to larger proportions to fight equally large monsters. Popular tokusatsu superhero shows in the 1970s included Kamen Rider (1971), Warrior of Love Rainbowman (1972), Super Sentai (1975) and Spider-Man (1978). Ambassador Magma is the title and protagonist of a manga and tokusatsu TV series created by Osamu Tezuka, the writer of Mighty Atom and Jungle Emperor. The TV series, produced by P Productions, was aired on Fuji TV from July 4, 1966 to September 25, 1967, lasting a total of 52 episodes. It is the first color tokusatsu TV series in Japan, beating Tsuburaya Productions' Ultraman to the air by six days. The show later aired in the US, dubbed in English, as The Space Giants. Digital Manga crowdfunded the manga, and it is currently available for digital purchase on their Emanga site. Ultraman is a Japanese tokusatsu science fiction television series created by Eiji Tsuburaya. It is a follow-up to Ultra Q, though not technically a sequel or spin-off. Tsuburaya Productions made 39 episodes that aired on Tokyo Broadcasting System (TBS) from July 17, 1966 to April 9, 1967. Its premiere topped the average rating set by Ultra Q and kept climbing each week, marking the show as a success. Kyodai Hero is a subgenre in tokusatsu that involves Japanese superheroes or robots with the ability to grow to immense heights to fight giant monsters. The Kyodai Hero is the mainstream superhero genre that is widely popular in Japan. The first and most famous Kyodai hero is Ultraman who made his debut in 1966. Since then, Ultraman has helped spawn the Kyodai hero genre with countless shows such as Godman and Iron King. The Return of Godzilla, released in Japan as Godzilla is a 1984 Japanese kaiju film featuring Godzilla, produced and distributed by Toho. The film is directed by Koji Hashimoto, with special effects by Teruyoshi Nakano and stars Ken Tanaka, Yasuko Sawaguchi, Yosuke Natsuki, and Keiju Kobayashi, with Kenpachiro Satsuma as Godzilla. The many productions of tokusatsu series have general themes common throughout different groups. Kaiju(怪獣,kaijū, literally "mysterious beast") productions primarily feature monsters, or giant monsters(大怪獣,daikaijū). Such series include Ultra Q , the Godzilla film series, the Gamera series, the Daimajin series, and films such as Frankenstein Conquers the World , War of the Gargantuas , and The X from Outer Space ( 宇宙大怪獣ギララ ,Uchu Daikaijū Girara). Kaijin(怪人, literally "mysterious person") productions primarily feature supervillains as their central character. This includes films such as The Secret of the Telegian , The Human Vapor , The H-Man , Half Human , and Tomei Ningen . Protagonists of the popular tokusatsu franchises mostly of the late 1970s (from back to front, left to right): Ultraman Jonias (Ultra Series), Battle Fever J (Super Sentai), Kamen Rider Stronger and Kamen Rider V3 (Kamen Rider Series), and Spider-Man. The photo also features anime character Doraemon on the far left. Since about 1960, several long-running television-series have combined various other themes. Tsuburaya Productions has had the Ultra Series starting with Ultra Q and Ultraman in 1966. P Productions began their foray into tokusatsu in 1966 with the series Ambassador Magma. They also had involvement in the Lion-Maru series which concluded in November 2006. Toei Company has several series that fall under their Toei Superheroes category of programming, starting in 1961 with the single series, Moonlight Mask . Then, they produced several other long running series, starting with Shotaro Ishinomori's Kamen Rider Series in 1971, the Super Sentai series in 1975, the Metal Hero Series in 1982, and the Toei Fushigi Comedy Series in 1981. Toei also produced several other television series based on Ishinomori's works, including Android Kikaider and Kikaider 01 , Robot Detective , Inazuman and Inazuman Flash , and Kaiketsu Zubat . Toei was also involved in the Spider-Man television series, which influenced their subsequent Super Sentai series. In 2003, TV Asahi began broadcasting the Super Sentai and Kamen Rider series in a weekly one-hour block known as Super Hero Time . Toho, the creators of Godzilla, also had their hands in creating the Chouseishin Series of programs from 2003 to 2006. In 2006, Keita Amemiya's Garo , a mature late-night tokusatsu drama was released, starting a franchise composed of several television series and films. Other mature late-night series followed, including a revival of Lion-Maru in Lion-Maru G , the Daimajin Kanon television series (based on the Daimajin film series), and Shougeki Gouraigan!! (also created by Amemiya). Various movies classified as tokusatsu actually work like generalized science fiction films. These include Warning from Space (宇宙人東京に現わる,Uchūjin Tokyo ni arawaru, Spacemen Appear in Tokyo), Invasion of the Neptune Men (宇宙快速船,Uchū Kaisokusen, High Speed Spaceship), The Green Slime (ガンマー第3号 宇宙大作戦,Ganmā daisan gō: uchū daisakusen, Ganma 3 Space Mission), The Birth of Japan (日本誕生,Nippon Tanjō), The Last War (世界大戦争,Sekai daisenso, Great World War), Japan Sinks (日本沈没,Nihon Chinbotsu, Japan Sinks), Virus (復活の日,Fukkatsu no Hi, Day of Resurrection), Sayonara Jupiter (さよならジュピター,Sayonara Jupitā), The War in Space (惑星大戦争,Wakusei Daisensō, War of the Planets), and Sengoku Jieitai 1549 (戦国自衛隊1549). Non-traditional tokusatsu films and television programs may not use conventional special effects or may not star human actors. Though suitmation typifies tokusatsu, some productions may use stop-motion to animate their monsters instead, for example Majin Hunter Mitsurugi in 1973. TV shows may use traditional tokusatsu techniques, but are cast with puppets or marionettes: Uchuusen Silica (1960); Ginga Shonen Tai (1963); Kuchuu Toshi 008 (1969); and Go Nagai's X Bomber (1980). Some tokusatsu may employ animation in addition to its live-action components: Tsuburaya Productions' Dinosaur Expedition Team Bornfree (1976), Dinosaur War Aizenborg (1977) and Pro-Wrestling Star Aztekaiser (1976). Hideaki Anno, Yoshiyuki Sadamoto, Takami Akai, and Shinji Higuchi set up a fan-based group called Daicon Film, which they renamed Gainax in 1985 and turned into an animation studio. Besides anime sequences, they also produced a series of tokusatsu shorts parodying monster movies and superhero shows. These productions include Swift Hero Noutenki (1982), Patriotic Squadron Dai-Nippon (1983), Return of Ultraman (1983) and The Eight-Headed Giant Serpent Strikes Back (1985). Tokusatsu techniques have spread outside Japan due to the popularity of the Godzilla films. Godzilla, King of the Monsters! first appeared in English in 1956. Rather than a simple dub of the Japanese-language original, this work represented an entirely re-edited version which restructured the plot to incorporate a new character played by a native English-speaking actor, Raymond Burr. Ultraman gained popularity when United Artists dubbed it for American audiences in the 1960s. In the 1990s, Haim Saban acquired the distribution rights for the Super Sentai series from Toei Company and combined the original Japanese action footage with new footage featuring American actors, resulting in the Power Rangers franchise  which has continued since then into sequel TV series (with Power Rangers Beast Morphers set to premiere in 2019  ), comic books,  video games, and three feature films, with a further cinematic universe planned. Following from the success of Power Rangers, Saban acquired the rights to more of Toei's library, creating VR Troopers and Big Bad Beetleborgs from several Metal Hero Series shows and Masked Rider from Kamen Rider Series footage. DIC Entertainment joined this boom by acquiring the rights to Gridman the Hyper Agent and turning it into Superhuman Samurai Syber-Squad . 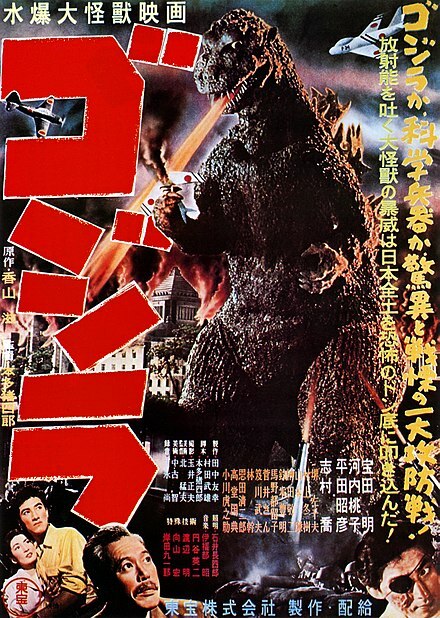 In 1961 England-based film-makers produced the Godzilla-style film, Gorgo , which used the same suitmation technique as the Godzilla films. That same year, Saga Studios in Denmark made another Godzilla-style giant monster film, Reptilicus , bringing its monster to life using a marionette on a miniature set. In 1967, South Korea produced its own monster movie titled Yonggary . In 1975, Shaw Brothers produced a superhero film called The Super Inframan , based on the huge success of Ultraman and Kamen Rider there. The film starred Danny Lee in the title role. Although there were several other similar superhero productions in Hong Kong, The Super Inframan came first. With help from Japanese special effects artists under Sadamasa Arikawa, they also produced a Japanese-styled monster movie, The Mighty Peking Man , in 1977. Concurrent with their work on Superhuman Samurai Syber-Squad, DIC attempted an original concept based on the popularity of Power Rangers in 1994's Tattooed Teenage Alien Fighters from Beverly Hills . In 1998, video from an attempted Power Rangers-styled adaptation of Sailor Moon surfaced, combining original footage of American actresses with original animated sequences. Saban also attempted at making their own unique tokusatsu series entitled Mystic Knights of Tir Na Nog , set in medieval Ireland and featured four, later five knights who transform using the power of the elements (for the most part) at they protected their kingdom from evil. Saban had also produced the live action Teenage Mutant Ninja Turtles series Ninja Turtles: The Next Mutation , which was known in the turtles fandom for introducing a female turtle exclusive to that series called Venus de Milo and eliminating the fact that the other turtles were brothers. The show primarily featured actors in costumes most of the time, but featured similar choreographed fights like other tokusatsu shows. In 2001, Buki X-1 Productions, a French fan-based production company, produced its own series, Jushi Sentai France Five (now called Shin Kenjushi France Five), a tribute to Toei's long running Super Sentai series. The low-budget television series Kaiju Big Battel directly parodies monster and Kyodai Hero films and series by immersing their own costumed characters in professional wrestling matches among cardboard buildings. In 2006, Mighty Moshin' Emo Rangers premiered on the internet as a Power Rangers spoof, but was quickly picked up by MTV UK for broadcast. In 2006, Insector Sun , a low-budget tribute to Kamen Rider was produced by Brazilian fans. Kaijū is a Japanese film genre that features giant monsters, usually attacking major cities and engaging the military and other monsters in battle. It is a subgenre of tokusatsu entertainment. This word originated from the Chinese Classic of Mountains and Seas. In Legendary Pictures' modern MonsterVerse, the in-universe organization Monarch refers to Kaiju as "Titans". The Super Sentai Series is a Japanese superhero team metaseries of TV series produced by Toei Company, and Bandai, and aired by TV Asahi. The shows are of the tokusatsu genre, featuring live action characters and colorful special effects, and are aimed at children. Super Sentai airs alongside the Kamen Rider series in the Super Hero Time programming block on Sunday mornings. In North America, the Super Sentai Series is best known as the source material for the Power Rangers franchise. The Metal Hero Series is a metaseries of tokusatsu superhero TV series produced by Toei for Japanese television. Mirrorman is the title superhero of a tokusatsu science fiction/kaiju/superhero TV series, Mirrorman. Produced by Tsuburaya Productions, the series aired on Fuji TV from December 5, 1971 to November 26, 1972, with a total of 51 episodes. This was Tsuburaya Productions' first non-Ultra superhero. Like Ultra Seven, Mirrorman was more of a dark and brooding science fiction drama than most other shows of its ilk. But by Episode 26, after major changes were forced upon the series by the network, it became a typical action-oriented superhero adventure of its era. The Ultra Series, also known as Ultraman, is the collective name for all the shows produced by Tsuburaya Productions featuring Ultraman, his many brethren, and the myriad Ultra Monsters. Debuting with Ultra Q and then Ultraman in 1966, the Ultra Series is one of the prominent tokusatsu superhero genre productions from Japan, along with Toei produced series Kamen Rider, Super Sentai and the Metal Heroes. The Ultra Series is also one of the most well known examples of the daikaiju genre, along with Toho's Godzilla series, and Daiei Film's Gamera series. However, the Ultra Series also falls into the kyodai hīro subgenre of tokusatsu shows. 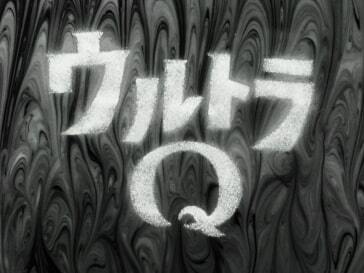 Ultra Q is a tokusatsu science fiction/kaiju series made in the tradition of Toho's many tokusatsu sci-fi/horror films. Ultraman: Towards the Future, released in Japan as Ultraman Great, is a Japanese Australian tokusatsu television show co-produced by Tsuburaya Productions and the South Australian Film Corporation. It is the 10th show in the Ultra series, the first Ultraman show to be produced during Japan's Heisei period, the first Australian-produced Ultraman show and the first production in the franchise to be entirely filmed outside of Japan. Ultraman Dyna is a Japanese tokusatsu TV show which aired from 7 September 1997 until 30 August 1998. It is a direct sequel to the previous Ultraman series, Ultraman Tiga and the 13th entry to the Ultra Series. The Kamen Rider series is a metaseries of manga, and tokusatsu television programs and films, created by manga artist Shotaro Ishinomori. The Kamen Rider media generally features a motorcycle-riding superhero with an insect motif who fights supervillains, often known as kaijin (怪人). The franchise began in 1971 with the Kamen Rider television series, which followed college student Takeshi Hongo and his quest to defeat the world-conquering Shocker organization. Its popularity has grown; the original series spawned television and film sequels and launched the Second Kaiju Boom on Japanese television during the early 1970s, impacting the superhero and action-adventure genres in Japan. Fireman, known as Magma Man in some markets, is a Japanese tokusatsu television series about a superhero, the title character, who fights kaiju and other villains. Produced by Tsuburaya Productions, the show was broadcast on Nippon Television from January 7 to July 31, 1973, with a total of 30 episodes. This was also one of several shows Tsuburaya did to celebrate the company's 10th anniversary. Hanuman and the Five Riders is a tokusatsu superhero film produced in 1975 by Chaiyo Productions of Thailand. Chaiyo's own Kamen Rider film, half of it uses footage from the Kamen Rider X film Five Riders Vs. King Dark. Koichi Sakamoto is a Japanese-born stunt actor, and producer for films and television. He is best known for his work as executive producer, as well as fight coordinator and frequent director, for the long running Power Rangers franchise. Hanuman vs. 7 Ultraman, known in Japan as The 6 Ultra Brothers vs. the Monster Army, is a tokusatsu science fiction/kaiju/superhero film produced in 1974 by Tsuburaya Productions of Japan and Chaiyo Productions of Thailand. It was released theatrically in Japan on March 17, 1979. Ultraman Zoffy: Ultra Warriors vs. the Giant Monster Army is a 1984 tokusatsu kaiju superhero film produced by Tsuburaya Productions and directed by Kōichi Takano. Ultraman: Great Monster Decisive Battle is a 1979 Japanese tokusatsu kaiju superhero film produced by Tsuburaya Productions, consisting of re-edited material from the original television series Ultraman. Compilation of episodes 2, 3, 8, 16 & 25. Ultraman, Ultraseven: Great Violent Monster Fight is a tokusatsu superhero kaiju eiga produced by Tsuburaya Productions in 1969. Uchu Sentai Kyuranger is a Japanese tokusatsu television series and the 41st entry of Toei's long-running Super Sentai metaseries, following Doubutsu Sentai Zyuohger. The show premiered on February 12, 2017, joining Kamen Rider Ex-Aid and later, Kamen Rider Build in the Super Hero Time line-up on TV Asahi affiliate stations until Kyuranger concluded on February 4, 2018. Kyuranger's main motifs are constellations and Greco-Roman mythology and it is the first Super Sentai series that introduced nine regular members right at the beginning, more than any of the previous installments which have typically started with five or fewer. ↑ Heffley, Lynne (November 25, 1993). "Low-Tech Equals High Ratings : Fox's Offbeat 'Mighty Morphin Power Rangers' Flexes Its Kidvid Muscle". Los Angeles Times. Retrieved August 28, 2012. ↑ Kelley, Shamus (February 17, 2018). "Power Rangers Beast Morphers Confirmed". Den of Geek!. Retrieved February 17, 2018. ↑ "Mighty Morphin Power Rangers Comics Coming From BOOM! Studios" . Retrieved 19 January 2017. ↑ "New Power Rangers films are coming after Hasbro acquires the franchise from Lionsgate". Digital Spy. June 1, 2018. Retrieved June 12, 2018. ↑ "WINNERS: Daytime Entertainment Creative Arts Emmy Awards". June 26, 2010. Retrieved 27 June 2010. ↑ "「KAMEN RIDER DRAGON KNIGHT」第37回デイタイム・エミー賞において最優秀スタントコーディネーション賞を受賞！ | 東映［テレビ］". 2010-06-29. Archived from the original on 2010-07-01. Retrieved 2010-07-04. ↑ "GMA-7 acquires exclusive rights to "Shaider"". pep.ph. Retrieved 2007-09-20. ↑ Pewarta: Nanien Yuniar. "Bandai buat mainan BIMA Satria Garuda". ANTARA News. Retrieved 2013-06-08. ↑ Pewarta: Nanien Yuniar. "BIMA Satria Garuda, Ksatria Baja Hitam Indonesia". ANTARA News. Retrieved 2013-06-08. ↑ "Mighty Moshin' Emo Rangers | MTV UK". MTV UK. Archived from the original on 2007-03-19. Retrieved 2013-05-16. Allison, Anne. Millennial Monsters: Japanese Toys and the Global Imagination. ISBN 0-520-24565-2. Craig, Timothy J. Japan Pop! : Inside the World of Japanese Popular Culture. ISBN 0-7656-0560-0. Martinez, Dolores P. The Worlds of Japanese Popular Culture: Gender, Shifting Boundaries, and Global Cultures. ISBN 0-521-63729-5.